It is well known that you can't fix a problem until you know what the problem is. But, in some cases it just costs too much to determine where the power is being used at a facility. Advanced metering initiative (AMI), smart meters, sub-metering, smart-buildings, building automation systems, and smart-grid are just a few of the "buzz-words" swirling around the technology options you might consider to help you get a better handle on the important question "where are my electricity dollars going?" Make intelligent choices about the type of power monitoring that is most appropriate for your needs. One size does not fit all! Understand your real needs and select tools that work for you in your environment -- with your budget! 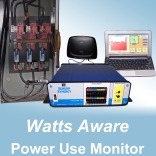 Determine if you need to measure and monitor all of the power coming into your facility or just the power used by your most power-hungry machines. Decide whether you want to use a permanently installed monitoring tool or a portable tool. Trade-offs include the usual issues -- cost, hassle of installation, and overall accuracy. Talk with your boss and peers. Try to understand what your real goal is and stick to it. Are your trying to verify the accuracy of the electric bill from your utility company or are you tasked with finding ways to reduce the electricity used at your facility? Select the accuracy you need for your goal. The world is full of trade-offs that we make all of the time. Measuring power use is subject to similar engineering trade-offs that you apply to other parts of your job. No magic here - just common sense. Trade-off monitoring system cost for accuracy of the results. Do you really need "revenue grade" measurements that are accurate to 0.2 % of the "actual value" or can you settle for a +/- 3% accuracy for 1/10 the cost? For example, when making a measurement of a recently manufactured part, you do not put every part under an electron microscope to verify that the finish is sufficiently smooth and within product specifications. No, you use an appropriate monitoring tool that is just accurate enough to tell you that your product is within the required specifications -- Typically, you just use the tool needed to get the job done -- and nothing more sophisticated or expensive. Stay focused on the goal - saving money on your electric bill. Don't get distracted by other issues that can hugely inflate the price of a power-use monitoring solution. For example, building automation systems have many "neat" features, but can be cost prohibitive if you are trying to defend a building automation system purchase just for power monitoring. Don't let an "Overkill" solution that can't be cost justified prevent you from implementing an energy cost reduction plan. There are reasonably priced systems that can provide actionable information to help you save money on your next electric bill - including Sensor Synergy's Watts Aware 118 solution . Select an electricity-use monitoring system that can fit your budget - even if it doesn't have every bell and whistle ever devised by mankind.